Hanover Powder Coating can service all of your powder coating needs to residents of the Ashland, Virginia and surrounding areas including: Richmond, Charlottesville, Glen Allen, Laurel, Lakeside, Mechanicsville, Tuckahoe, East Highland Park, Bon Air, Highland Springs, Chester, Hopewell, Colonial Heights, Petersburg, Fredericksburg, and Williamsburg. Customers come to us with a lot of questions about their powder coating needs. We hope the following information can help you get the answers. You can also click the button below and get a free quote, or click the contact button with your specific question. Why is powder coating superior to traditional solvent-based paints? 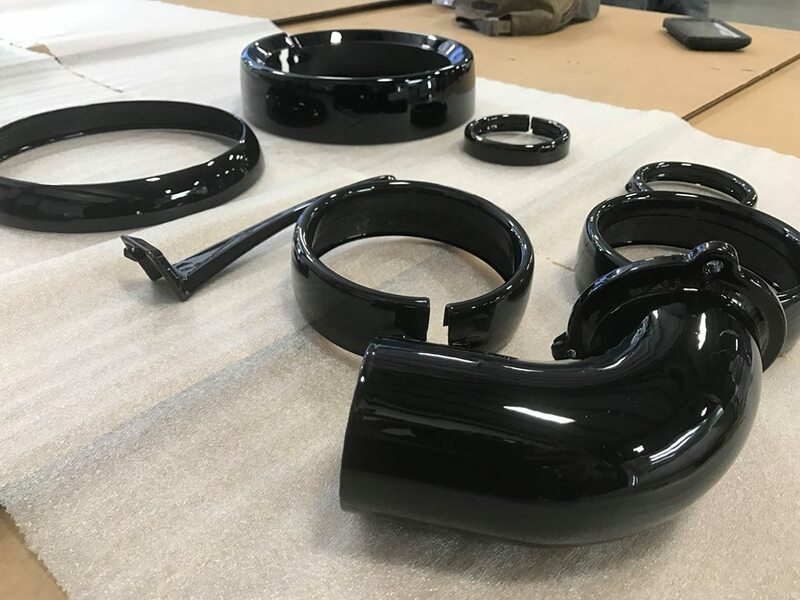 Powder Coating has actually been around since the 1950’s but it wasn’t until the 1980’s that it started to become popular as a means of coating metal parts. What was once reserved for heavy industrial applications and mass production is now completely accessible to the home-owner, the hobbyist, and the enthusiast. Powder Coating is a method of applying a decorative and protective finish to virtually any type of metal. The powder used in the process is a mixture of finely ground particles of pigment and resin, which is electrostatically dusted onto the surface of the parts to be coated. Flowing from a special powder coating gun, the charged powder particles adhere to the electrically grounded surfaces. The part then goes into a curing oven until the powder is heated and fused into a smooth coating. The result is a uniform, durable, high quality and attractive finish. Powder coating is the fastest growing finishing technology in North America, representing over 10% of all industrial finishing applications. Why choose powder coating over traditional solvent based paints? Powder coating is more durable. 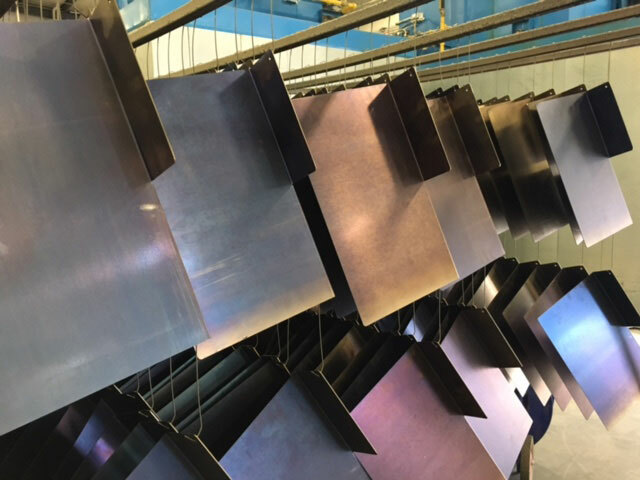 Powder Coating gives consumers, businesses, and industries one of the most economical, longest lasting, and most color-durable quality finishes available on virtually any type of metal. Powder coated surfaces are more resistant to chipping, scratching, fading, and wearing than other finishes. Color selection is virtually unlimited with flat, satin, gloss, high gloss, metallic, candies, clear, iridescent, fluorescent, wrinkle, hammer tone, and glitter finishes available. Colors stay bright and vibrant longer. Texture selections range from smooth surfaces to wrinkled or matte finishes, and rough textures designed for hiding surface imperfections. Powder coating is environmentally friendly. Solvent based paints are notorious polluters as the compounds contain volatile organic compounds (VOC’s). Powder coating, on the other hand, contains no solvents and releases negligible, if any, amounts of VOC’s into the atmosphere. Therefore, there is no longer a need for finishers to buy and maintain costly pollution control equipment. Powder coating is very cost effective. 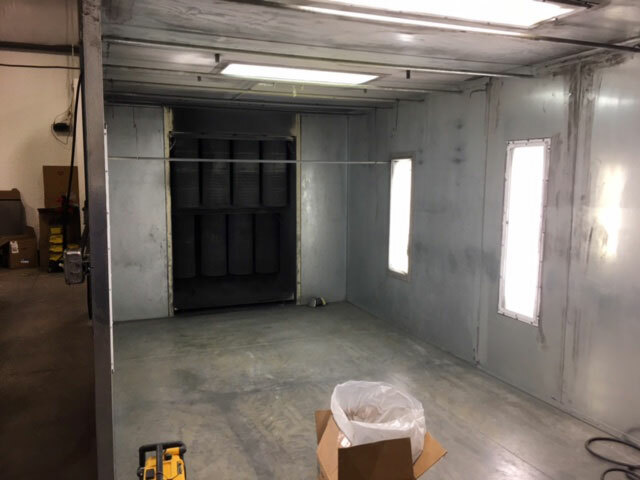 Since powder coating only uses the material required to coat the part, versus a whole mixed gallon or quart of paint, as well as the elimination of hardeners and catalysts, the material cost is greatly reduced. Prep time beyond sand blasting and cleaning is very minimal which cuts down on labor. Powder coating non- metal objects. As we mentioned, it is possible to powder coat most metal objects, even chrome plated ones. You can also powder coat non-metallic objects such as wood, glass, composites and even MDF but the technique is different. The solution to powder coating these items is pre-heating. You can heat up the object in the oven, remove the object, and powder coat it before it cools. When the powder hits the heated part, it will slightly melt on contact, causing it to stick. After coating the entire part like this, you then place the part back in the oven and cure it like normal. Not all powder coating companies offer the same quality. As in any business, there are good companies and not so good companies. 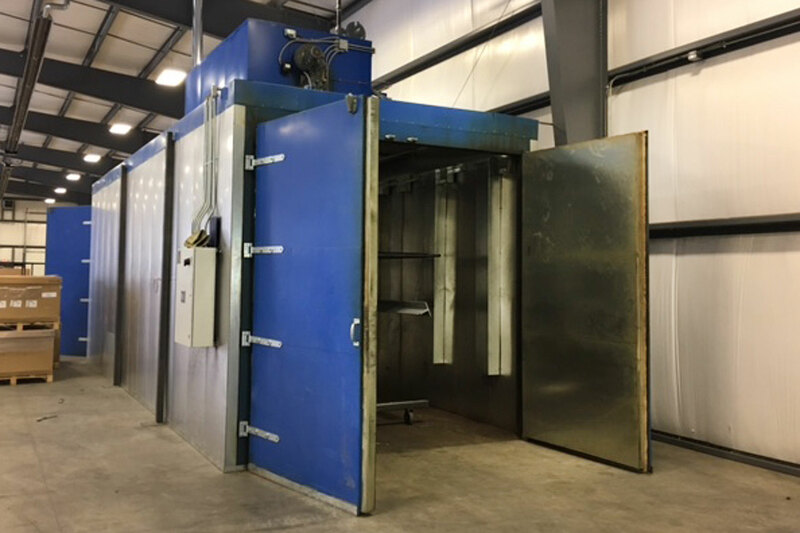 With paint and powder coating it all comes down to attention to detail of the operators, quality of materials, and quality of tools being used. Peeling Powder Coating- This is typically caused by poor adhesion caused by poor substrate preparation or insufficient curing. A good powder coating company will always ensure the item being coated is pre-treated and ready to be coated. 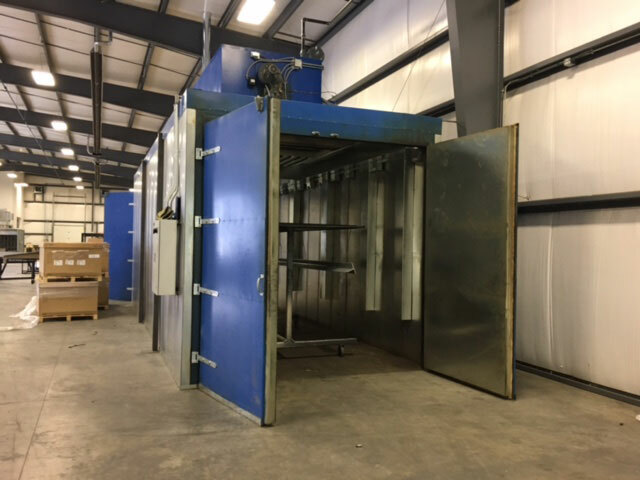 Dust Particles in the Finish- Can be a result of a dirty shop, dirty spray booth, inferior filters in the air supply, faulty spray booth filters and so on. Orange Peel- An inexperienced powder coating facility or simply one who does not care about quality will often have issues with orange peel. This is often a result of improper particle size distribution and poor gun control. Color Shade Difference Compared to other Panels- Again, insufficient equipment such as inadequate oven conditions and controls, or an oven with “Hot Spots” causes this. All work pieces must have the same curing conditions to create a consistent finish. Pinholes on the Coated Surface- This stems from cross contamination or back ionisation. These are a result of a dirty powder coating system and also improper distance of gun to the part. 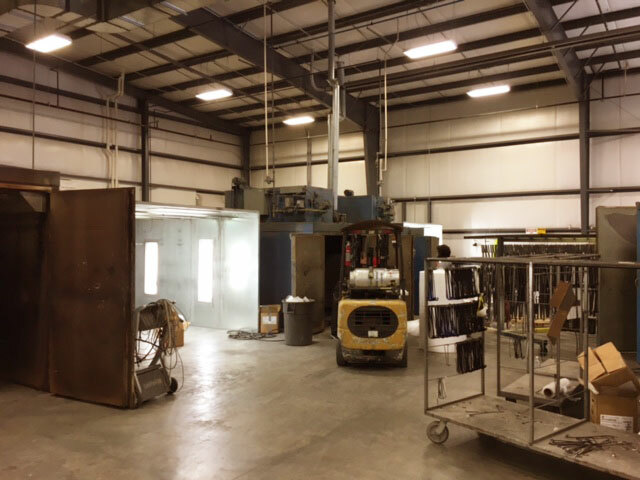 At Hanover Powder Coating in Richmond VA, all of our technicians have anywhere from 10-30 years experience in powder coating. We take pride in the care and preparation we offer as well as the quality and durability of the final finish. Copyright 2019 Hanover Powder Coating. All rights reserved.